My sister and I love tacos and on some occasion if we have enough time we prepare this food to change the usual menus for the usual occasions. Sometimes we really have a hard time piling what we finished doing and we want to distribute it as soon as we're finished doing tacos one by one. It's easier if we can do it groups and just arrange it on the table. 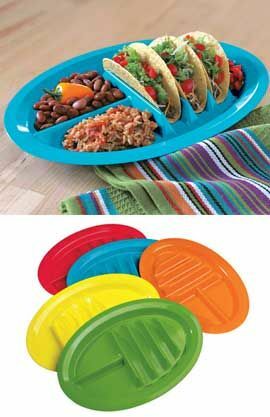 Well this Taco Plates would be an ideal stacking plates for the tacos and we can prepare it continously. This is just right for our usual problem in preparing our favorite food. Now I'm going to tell this to my sister so we can plan more Taco times in family's celebrations. The designer of this plate is so smart and maybe he or she must be a lover of tacos too just like us.